Use this helpful resume sample if you're considering applying for a position within the healthcare industry. The electronic resume is making it even easier now to apply for jobs. Use this sample resume as a reference if you're planning on applying for a healthcare human resources position. Follow these simple rules, and your cover letters will stand out from the crowd. Applying for a position within healthcare management? Use this sample resume as a reference when you're crafting your own resume. Get healthcare marketing sample resumes. The Hospital Jobs Online Career Center features interview tips and resume help. Your research starts here. Applying for a job as a hospital administrator? Then make sure to take a look at this sample resume. Learn to create a machine scannable resume to ensure it can be viewed by the latest document imaging technology. 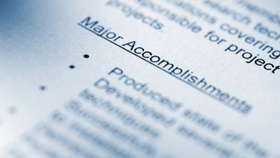 A well-written resume is key to landing an interview, and is the most important document in your professional life. Learn to do it right.